“They don’t come much better than that,” said the lady serving drinks in the Winner’s Circle, reflecting on the victory by Fly To The Moon (3 f Reliable Man – Fly Silca Fly, by Hawk Wing) in the $10,000 BDO Maiden 1600 metres on 25 July at Matamata. 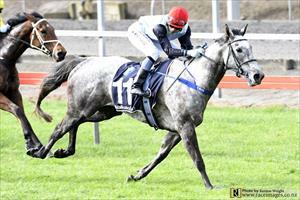 Trained locally by Mike Moroney & Pam Gerard, the grey filly had produced the run of the meeting for second when debuting over 1200 metres on 30 May at Matamata, and once again on Heavy10 footing she delivered emphatically. In the interim, on 15 June in the NZB Insurance Pearl Series Maiden 1400 metres at Te Teko, she had kept finding the line from the rear for seventh, and travelled like the winner a fair way out on this occasion with the aid of a lovely ride from Shafiq Rusof. Away well from barrier nine, Shafiq steadied Fly To The Moon to eighth at the 800m, improved to be camped on the leaders inside the 600m, was clear turning for home and after quickening to lead at the 200m she strode clear to win easily by one and a quarter lengths. “I was a bit worried at the start because she was caught wide, but once I got some cover she travelled very well,” Shafiq said. “When I revved her up at the 400m she took off and kept going strongly to the line, and I think she can improve more on that. Fly To The Moon ran the 1600 metres in 1:43.9, last 600m in 39.8, and paid $4.90 & $2.00 on the NZ TAB tote. Bred and owned by Paul Moroney, Patrick Bennett, and David Dimmock, Fly To The Moon is the second foal from Fly Silca Fly, who won three times in the U.K., before notching a win over 1400 metres at New Plymouth. “Back on her home track, she found a nice position, came into it at the right time and it was a good ride by Shafiq,” said co-trainer Pam Gerard. “She’s still learning the game, was quite green earlier on in her career, but showed improvement to settle nicely amongst horses and did everything right today. She was a lot more relaxed, like a racehorse needs to be, and seemed to win with a bit more in hand. “Although just her third start, she has matured a lot mentally with those races, getting the hang of things and should have another win in her this time in. While she’s happy and racing well, and doing things right, we’ll just keep her ticking along while the tracks are off, as she seems to enjoy them. I think she could be quite handy with another year on her.